Stedelijk Museum, Van Gogh Museum and the Rijksmuseum. The main room of Kattenkabinet full of cat paintings and drawings. Amusement park at night in front of illuminated Koninklijk Paleis (1865), Dam Square on Queen's Day celebrations. Lion and crown plaque adorns Centraal Station. Gabled houses around the courtyard of a former 14th century convent Begijnhof. Art collection with paintings by Pothoven, Compe, de Oude, Keun and Chalon at Amsterdam's Historisch Museum. Shy Mara (Dolichotis patagonum) at Artis Zoo. View of stone bridge leading across Voorburgwa with Gothic Oude Kerk, built in 1340, in the background. Partygoers on a boat on Prinsengracht at the Queen's Day celebrations. A group of partygoers aboard a boat on Prinsengracht celebrate Queen's Day. Dancing partygoers wearing oversized crowns on Thorbeckeplein for the Queen's Day celebrations. Kids lined up for a game of fishing for a soda bottle, in Vondelpark. Socialist propaganda on display at Verzetmuseum, Plantage Kerklaan 61a. Racks of maps for sale at A La Carte Bookstore on Utrechtsestraat. Facade of Magna Plaza, former GPO, now deluxe shopping centre. A sign at COBRA Museum of Modern Art in Amstelveen. Looking through a fence at the Arena Stadium, a massive, high-tech complex which seats 52,000 people, on Arena Boulevard. Early patrons at the bar of De Smoeshaan, one of Amsterdam's Theatre cafes, on Leidsekade. Merchandise displayed at the Magic Mushroom Gallery on Spuistraat 249 in Amsterdam. A neat double room at Bilderberg Jan Luyken, a hotel on Jan Luykenstraat. A small group of revellers on the dance floor on Student Night at the Paradiso, a night-club in a converted church on Weteringschans. A sightseeing boat passing the Cafe De Sluyswacht on Jodenbreestraat. Patrons at Downtown, a cafe on Reguliersdwarsstraat. Twenty minutes shy of midnight at the Bamboo Bar on Lange Leidsedwarsstraat. Patrons in the Cafe de Pels on Huidenstraat, a typical Amsterdam Brown Cafe; so called because of the staining of the walls from years of exposure to cigarette smoke. Diners enjoying a meal at De Ondeugd, a restaurant on Ferdinand Bolstraat. Spinning cigarette packets in a display behind the counter at 451'F Tobacco Store on Leidsestraat. Snacks and sushi in a display case at Deshima Proeflokaal on Weteringschans. Display of merchandise for the drug-taking consumer at The Magic Mushroom Gallery on Spuistraat. Geometric designs on the facade of an old factory on Oudezijds Voorburgwal. Water pipes: smoking paraphernalia on display at Conscious Dreams, on Kerkstraat. The shopfront of Athenaeum Booksellers on Spui. Detail of shop tags on a rack of blouses and shirts at Exota on Hartenstraat. Happy staff standing behind the counter at Gary's Late Night Muffins, on Reguliersdwarsstraat. An etching for sale at EH Ariens Kappers, a gallery on Spiegelstraat. Cyclist in the park at early morning, Vondelpark. Flower stall at Albert Cuyp market. Cramming into a ferry to cross JJ River. Window at the Museum of Amsterdam School of Architecture in former post office, Het Schip. 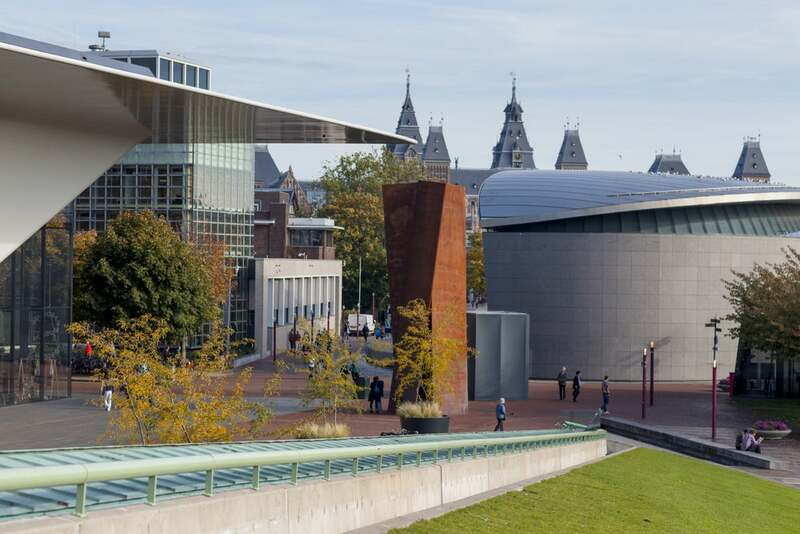 Modern bilding of Van Gogh Museum. Visitor in canal tour boat. Pianist playing inside Calvinist Baroque church Noordekerk. Painting of Jewish wedding in 1886 at Jewish Historical Museum. People promenading past the Van Gogh Museum. Panama restaurant on Oosterlijke Handelskade. Shoebaloo shoe shop on Leidsestraat. Soul blues group Kindred the Family Soul at Paradiso. Bar de 2 Zwantjes on Prinsengracht. Antique shop on Nieuwe Spiegelstraat. Strolling along the canals of Jordan, Prinsengracht. Driving across bridge on Golden Bend on Prisengracht. Kokopelli Shop, selling psychedelic mushrooms, in the Red Light District. Begijnhof 34 courtyard, north of Spui square in central Amsterdam. Patrons inside Condomerie Het Gulden Vlies novelty condom shop. De Drie Fleschjes tasting house with yellow Dutch gin in glass. Lights along canal bridges along Herengracht near the famous 'Golden Bend'. Interior of Nomads Restaurant in Western Canal belt, Jordaan area. Cat in small inner courtyard Karthuizers Straat in the Jordaan area. Boats, scooters and pedestrians pass over one of the seven bridges line, the famous 'Golden Bend' in city centre. Visitors leaving Van Gogh Museum. Rear modern annexe of Van Gogh Museum. Performance at Boom Chicago theatre in Leidseplein. Customer inside EH Ariens Kappers store. Lights along canal bridges at famous 'Golden Bend' in the city centre. Busker and crowd at Leidseplein in Southern Canal belt. Crowds at Albert Cuyp Market in De Pijp area. Band at 'Winkel' cafe next to Noodemarkt in Jordaan area. De Taart van mân Tante cafÃ© tea room in De Pijp . People at outdoor tables at Leidseplein in Southern Canal belt. Cycling on cargo bike in Vondelpark. Picnic in Vondelpark in afternoon light. Soccer on Museumplein with Concertgebouw in background. Customers inside De Kaaskamer cheese shop in the Nine Straatjes area. Cheese inside De Kaaskamer cheese shop in the Nine Straatjes area. Patrons wait for performance at Koninklijk Theater Carre. Customers inside Santa Jet shop in the Nine Straatjes in the Southern Canal Belt. Band plays at Noodemarkt in the Jordaan area. Cafe de Jaren in city centre. Cat inside Poezenboat Cat Boat in the Nine Straatjes in the Southern Canal Belt. Cycling past Magna Plaza with the Royal Palace in background. Sailors outside the Royal Palace in city centre of Amsterdam. Patrons inside Damkring coffee shop. Greenpeace art nouveau building (foreground) with guardian angel tableau and Westerkekr church in background. Rembrandtâs 'The Night Watch' at the Rijksmuseum.